The Jura are a series of mountains, plateau and valleys which border the north west of the Alps. The western Jura is lined with a series of dramatic valleys and gorges which harbour medieval towns, stunning waterfalls and a patchwork of vines. Our guided walking holiday in the Jura has a series of moderate day walks which explore these “reculée” from above and below, including the Hérisson valley which contains a breathtaking collection of 31 waterfalls in a 3km stretch. Our independent walking holiday: Jura Wine Trails takes a linear course from Arbois in the north to Baume les Messieurs in the south following the edge of the plateau and the reculees where the vines are grown on steep slopes. The wines of the Jura are unique and much sort after French wines. From the soft and sweet wines such as the “Vin de Paille” to the multi-layered aromas of the legendary Vin Jaune, you won’t be left indifferent tasting the wines from the Jura. The reculee or closed gorges are composed of 3 types of rock: the upper layers, which form the vertical escarpments and the surface rock of the plateau, are limestone. Halfway down the gorge you’ll find marl on steep slopes, where the majority of the Jura vines grow, whilst the base of the valleys are covered in alluvial deposits since the last ice age. The average depth of the valleys is 200m. 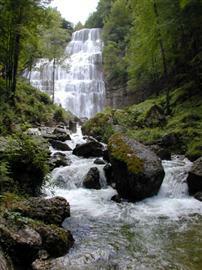 The closed gorges of the Jura are located where the limestone has fault lines or other weaknesses. At the creation of the faults one part of the limestone layers became displaced vertically compared to the adjacent rock. Over time the higher ground became eroded so that the plateau remained roughly horizontal. These limestone layers, however, are separated by layers of Marl, which are softer rocks with higher clay content. This meant that the more or less horizontal landscape now had two different rock types adjacent to one another separated by a fault line. The streams and rivers draining the plateau converged towards the fault which served as a drain. The water easily eroded the soft marl creating a small valley. Over time surface drainage continued to erode the valley, with the marl being eroded quicker than the harder limestone. The erosion led to valleys where the limestone formed vertical escarpments, whilst the marl created steep slopes. At different geological times, the surface rocks allowed water to permeate underground through the limestone eroding it via chemical processes. This is the case today where the majority of streams from the higher hills disappear underground and emerge near the base of the closed gorges forming waterfalls and associated limestone deposits. It was originally thought that the formation of these gorges or reculee were caused by massive collapse due to the weight of the Jura ice sheet covering the region. The specific morphology of the gorges, however, conforms to much more progressive erosion rather than a sudden collapse. Glaciers coming from the ice sheet would have followed these deep valleys and would have considerably accelerated the erosion, as would the huge quantities of melt water produced at the end of the last ice age. 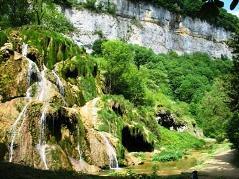 The most celebrated reculee or gorge of the Jura is without doubt the one at Baume les Messieurs. The village of Baume-les-Messieurs is located at the confluence of 3 branches of the gorge. 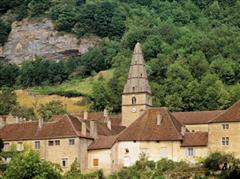 It is a wonderful historic settlement with an abbey, first created in the 10th century. It is also classed as one of the prettiest village in France. You'll have the opportunity to explore this beautiful village on both our guided and self guided independent walking holidays in the Jura. The gorge at Baume is 9.5km long, 1.1km wide and 200m deep. It has 4 branches with three of these coming together at the point where the village of Baume les Messieurs is located. A further branch joins further north with the gorge ending near the villages of Domblans and Voiteur. At the closed end of the main branch of the gorge, the Dard river re-emerges at about half way up the cliff. During wet conditions this creates a spectacular spout of water. A hundred metres or so further on and the river Dard plunges over a cliff created from limestone and organic deposits known as tufs. Behind the higher waterfall is the entrance to the caves of Baume which can be visited and contain some impressive high caverns which reach almost to the surface of the limestone plateau. Views from the top of the gorge over the village and of the reculee are spectacular.